The latest science fiction and fantasy novels selected from the new material this month, include several that are dystopian themed, along with alien encounters and space warfare. Also several novels weave into their plots the present problems of global warming, war criminals, animal rights, and epidemics. All ensure fascinating, thrilling reading. Valiant dust / Richard Baker. The spark / David Drake. Netherspace / Andrew Lane and Nigel Foster. Austral / Paul J. McAuley. 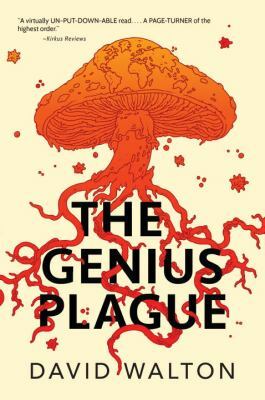 The genius plague / by David Walton. This month the selection from the new material received in this genre covers a broad range of themes. From conspiracies to cybernetics, robots to vampires, humour to horror, and survival to dystopia, plus many more, all provide some brilliant out of this world reading. The island will sink / Briohny Doyle. It devours! : a welcome to Night Vale novel / Joseph Fink & Jeffrey Cranor. The fifth doll / Charlie N. Holmberg. The fall of the House of Cabal / Jonathan L. Howard. The salt line / Holly Goddard Jones. The real-town murders / Adam Roberts. The uploaded / Ferrett Steinmetz. From astronomy to cyberterrorism, cults to space colonies, virtual reality to time travel, artificial intelligence to alternative histories, this selection of new science fiction and fantasy novels illustrates the wonderful diversity of theme and brilliant imaginations of writers in this genre. Good morning, midnight : a novel / Lily Brooks-Dalton. Sea of rust / C. Robert Cargill. Paradox bound : a novel / Peter Clines. Iron angels / Eric Flint & Alistair Kimble. Lost in Arcadia / Sean Gandert. The sea peoples : a novel of the Change / S. M. Stirling. Included in our selection of new Science Fiction and Fantasy novels recently added to Wellington City Libraries collection is the second novel from the highly acclaimed Russian author Dimitry Glukovsky, titled Metro 2024. With wonderfully vivid characters, tension that is almost claustrophobic and much dark humour, this proves an exciting read. Kangaroo too / Curtis C. Chen. Metro 2034 / Dmitry Glukovsky ; translated from Russian by Andrew Bromfield. Shattered minds / Laura Lam. Raven stratagem / Yoon Ha Lee. Noumenon / Marina J. Lostetter. All systems red / Martha Wells. This month’s selection of new Science Fiction and Fantasy novels from our recently received new material includes The Black Elfstone: the fall of Shannara, the first book Terry Brooks’s new series. Also included is the first book in Yoon Ha Lee’s series Machineries of Empire, titled Ninefox gambit. Creation machine : a novel of the Spin / Andrew Bannister. The black elfstone : the fall of Shannara / Terry Brooks. The city of woven streets / Emmi Itäranta. The kill society : a Sandman Slim novel / Richard Kadrey. Birthrights / J. Kyle McNeal. Mightier than the sword / K. J. Parker. The world raven / A.J. Smith. The book of Joan : a novel / Lidia Yuknavitch.